In the early summer of 2012 I made an exciting discovery. Normally, Burroughs bibliographies in Sweden mention the 1921 edition of Tarzan, apornas son (Tarzan of the Apes) as the first Burroughs book in Swedish, but as I was searching the Swedish library database Libris for Burroughs books available at the nearest university library, I found an entry for a book published in 1920, by a different publisher. The book in question is Den vansinnige kungen (The Mad King), and not only was this the first (indeed only) Swedish edition of that book, it was also published a full six years before the story was printed in book form in English. The story was originally published in the pulp magazine The All-Story Weekly in 1914 with the title "The Mad King". 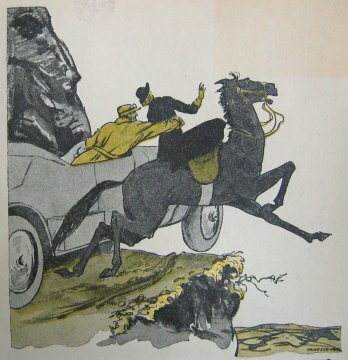 The sequel "Barney Custer of Beatrice" came the following year in the same magazine, but then it took until 1926 before the first (English-language) book edition saw print. As in all subsequent reprints, both parts of the story were collected in one volume. So in other words, this appears to be a previously unknown first edition of a Burroughs book, possibly the only time a Burroughs book was printed in translation before the original English language. 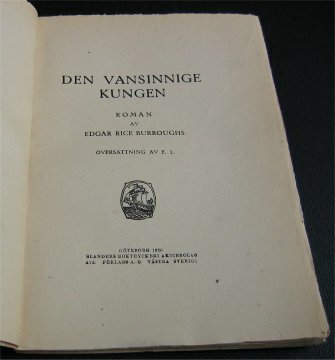 The Swedish edition, however, only contains the first part from 1914. The copy I examined is to be found in the Carolina Library at Uppsala University. According to the Libris database, this is one of only two Swedish library copies of the book (the other one is at the Royal Library in Stockholm). Due to its age, the copy may not be checked out of the library, so I was only able to browse it on location in the library reading rooms. 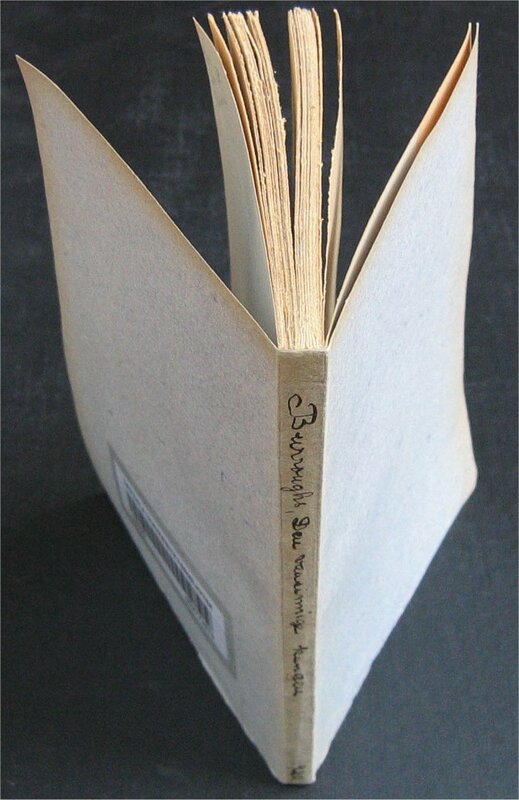 The book is a thread bound octavo in soft covers, 144 x 204 mm. The pages have been cut but not trimmed. There is no proper library rebinding, but a protective extra cover of heavy blue paper has been glued to the spine. Author, title and year have been hand-written on the new spine. The original spine is thus forever hidden from the eyes of man. The insert is 128 pages, with 120 content pages. There are no interior illustrations. There is a cover illustration, depicting a scene from the first chapter where the hero rescues the heroine from a runaway horse. The cover artist is not credited, but there is a largely illegible signature in the lower right hand corner of the picture. By comparing other contemporary covers with the same signature, I have come to the conclusion that the signature reads "PROESSDORF". This must reasonably stand for Alfred Proessdorf (1882-1925). He was born in Leipzig, Germany, but after his education in Düsseldorf he moved to Sweden. During most of his career as an artist he lived in Gothenburg. Among many other things, he did cartoons in Swedish magazines. The publisher information on the indicia page and on the back cover are essentially identical. The back cover gives "Elanders Boktryckeri Aktiebolag, Göteborg 1920. Avd. Förlagsaktiebolaget Västra Sverige." 1920, of course, is the year of publishing, and "Göteborg" is the Swedish spelling of Gothenburg. 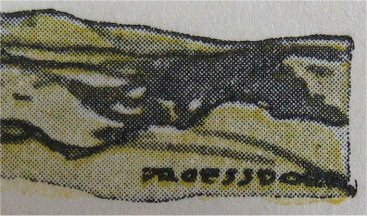 "Elanders Boktryckeri Aktiebolag" (Elander’s Book Printer Incorporated) is the printer, and "Förlagsaktiebolaget Västra Sverige" (The Publishing Corporation Western Sweden) is the publisher. The abbreviation "Avd." (normally meaning department or division) seems to indicate that the publisher is a subsidiary of the printer. Elanders, best known in Sweden for printing the telephone directory during many decades, still exists and is today a worldwide printing corporation. Förlagsaktiebolaget Västra Sverige has been difficult to find information about, but the company still existed in the 1970s, at least. 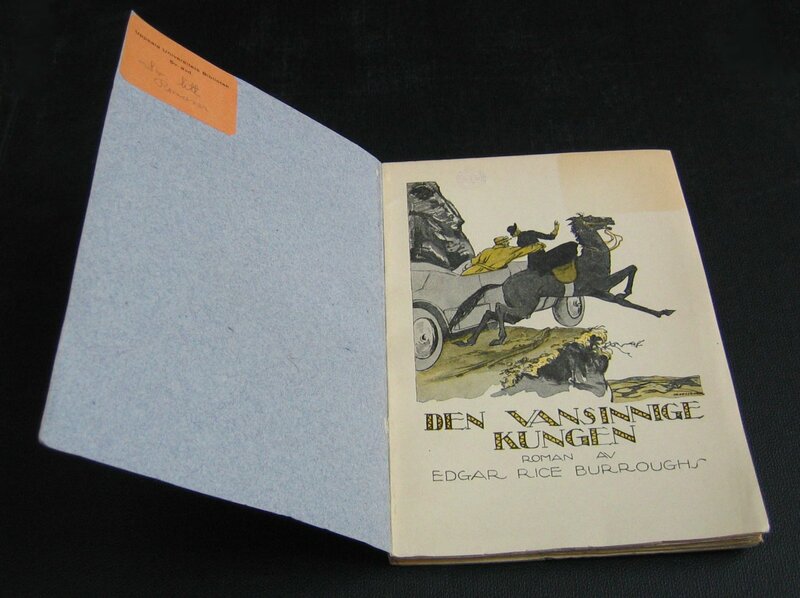 A few years before Den vansinnige kungen, they also published some H. R. Haggard novels in Swedish. Exactly why the publisher chose this particular story, we shall probably never know. At the time, Burroughs was more or less completely unknown in Sweden. The Tarzan of the Apes movie with Elmo Lincoln (Tarzan i apornas land in Swedish) had apparently been fairly successful a couple of years previously, but otherwise Burroughs had yet made no impression upon the Swedish cultural consciousness. We can only guess that some editor had seen “The Mad King” in All-Story and liked it well enough to give it a try with a Swedish audience. I have not tried to find information about the print run. Swedish is a small language, and most books are printed in relatively small runs. Regardless of the original number of printed copies, the fact that the title apparently only exists in two libraries indicates that the book is rare. A quick search I did with the major Internet-based Swedish book-sellers did not score any hits, strengthening that impression. This was apparently the only time that Förlagsaktiebolaget Västra Sverige published a Burroughs story. By 1921, Hökerbergs Förlag seems to have acquired exclusive rights to Burroughs' books in Swedish. Beginning with Tarzan, apornas son (Tarzan of the Apes), they remained the only publisher of Burroughs books until the 1970s. The translator is not named, but the indicia credits the translation to the signature "E. L." Some other contemporary books from the same publisher are translated by one Evelina Lönegren (1850-1929), so it is possible that she is the one behind those initials. The Swedish professor of literature Dag Hedman has claimed that "E. L." is the signature of Ernst Lundquist (1951-1938), but unlike Ms. Lönegren, he never translated any books for Förlagsaktiebolaget Västra Sverige under his own name, so my gut feeling is that Lönegren is the more probable of the two. I have been able to find next to no biographical information about Ms. Lönegren, except that she is buried in Jönköping. The last book I have found with a translation credited to "E. L." was published in 1926. The title is a straight translation of the original, though the translation of the contents, in accordance with the practice of the time, is more of an interpretation than an exact translation. Paragraph by paragraph, it says basically the same thing, but on a more detailed level, the translator has taken great liberties. Whether this free translation improves upon the text or ruins it, I shall leave for others to judge. 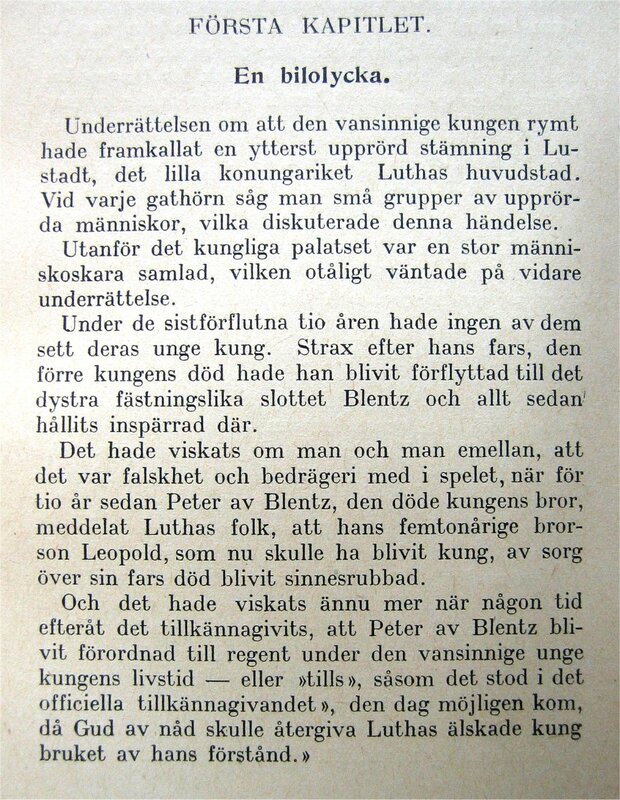 Below are the first few paragraphs of the novel, as they appear in the original and in the Swedish translation. I have also added my own re-translation of the Swedish text. All Lustadt was in an uproar. The mad king had escaped. Little knots of excited men stood upon the street corners listening to each latest rumor concerning this most absorbing occurrence. Before the palace a great crowd surged to and fro, awaiting they knew not what. For ten years no man of them had set eyes upon the face of the boy-king who had been hastened to the grim castle of Blentz upon the death of the old king, his father. There had been murmurings then when the lad's uncle, Peter of Blentz, had announced to the people of Lutha the sudden mental affliction which had fallen upon his nephew, and more murmurings for a time after the announcement that Peter of Blentz had been appointed Regent during the lifetime of the young King Leopold, "or until God, in His infinite mercy, shall see fit to restore to us in full mental vigor our beloved monarch." Underrättlsen om att den vansinnige kungen rymt, hade framkallat en ytterst upprörd stämning i Lustadt, det lilla konungariket Luthas huvudstad. Vid varje gathörn såg man små grupper av upprörda människor, vilka diskuterade denna händelse. Utanför det kungliga palatset var en stor människoskara samlad, vilken otåligt väntade på vidare underrättlse. Under de sistförflutna tio åren hade ingen av dem sett deras unge kung. Strax efter hans fars, den förre kungens död hade han blivit förflyttad till det dystra fästningslika slottet Blentz och allt sedan hållits inspärrad där. 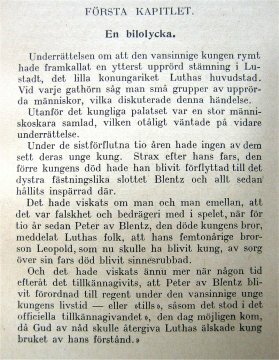 Det hade viskats om man och man emellan, att det var falskhet och bedrägeri med i spelet, när för tio år sedan Peter av Blentz, den döde kungens bror, meddelat Luthas folk, att hans femtonårige brorson Leopold, som nu skulle ha blivit kung, av sorg över sin fars död blivit sinnesrubbad. The report that the mad king had escaped, had created a very excited mood in Lustadt, the capital of the small kingdom of Lutha. At every street corner there were small groups of excited people, who discussed this event. Outside the royal palace a large crowd had gathered, which eagerly waited for further reports. During the past ten years none of them had seen their young king. Soon after his father’s, the former king’s death he had been transferred to the dreary fortress-like castle Blentz and ever since held captive there. And there had been more whispers when some time after it had been announced, that Peter of Blentz had been appointed regent during the mad king’s lifetime -- or "until", as the official announcement said, "the day possibly arrived, when God out of mercy would return to Lutha's beloved king the use of his faculties." “I can never forgive you,” she cried, "for not being the king, for I am betrothed to him--and I love you!" Before she could prevent him, Barney Custer had taken her in his arms, and though at first she made a pretense of attempting to escape, at last she lay quite still. Her arms found their way about the man’s neck, and her lips returned the kisses that his were showering upon her upturned mouth. Presently her glance wandered above the shoulder of the American, and of a sudden her eyes filled with the terror, and, with a little gasp of consternation, she struggled to free herself. "Let me go!" she whispered. "Let me go--the king!" Barney sprang to his feet and, turning, faced Leopold. The king had gone quite white. "Failing to rob me of my crown,” he cried in a trembling voice, “you now seek to rob me of my betrothed! Go to your father at once, and as for you--you shall learn what it means for you thus to meddle in the affairs of kings." --Jag kan aldrig, sade Emma, i det hon reste sig upp och med en oändligt sorgsen blick såg på Barney, förlåta er att ni ej är kungen, ty er älskar jag, men honom är jag trolovad med. --O, min egen lilla älskling! utbrast Barney i det han slöt henne i sin famn. Först ville hon rycka sig ur hans famn men därpå slog hon sina armar om hans hals och när han kysste henne, besvarade hon hans kyss. I ett nu var kungen, utom sig av raseri och svartsjuka, vid deras sida. --Då ni inte kunde beröva mig min krona, försöker ni alltså att frånröva mig min trolovade, sade han i förbittrad ton till Barney. Gå genast tillbaka till er far, tillade han vänd till Emma, som dragit sig ur Barneys famn så fort hon fått syn på kungen. --I can never, said Emma, as she stood up and with an infinitely sad complexion looked upon Barney, forgive you that you are not the king, for you I love, but to him I am betrothed. --Oh, my own little darling! exclaimed Barney, as he enclosed her in his arms. At first she wanted to tear away from his arms but then she wrapped her arms about his neck and when he kissed her, she kissed him back. Immediately the king, beside himself with rage and jealousy, was by their side. --Since you cannot rob me of my crown, you thus try to steal away my betrothed, he said in an embittered tone to Barney. Go back to your father at once, he added facing Emma, who had pulled back from Barney’s embrace as soon as she had seen the king. Names in the book are more or less the same as in the original. The most important difference that I noticed is that the name "von der Tann" is changed to "von der Taun". Otherwise, I could only find a few minor changes in spelling. "Coblich" has become "Coblick", "Ludwig" is now "Ludvig", and "Carl Schonan" is "Karl Schonan". An interesting curiosity is that all reference to Barney Custer's home town Beatrice have been removed. Whenever his origin is mentioned, he is said to be simply from "Nebraska in the United States". The translator must have felt that the Beatrice reference was too obscure for Swedish readers. 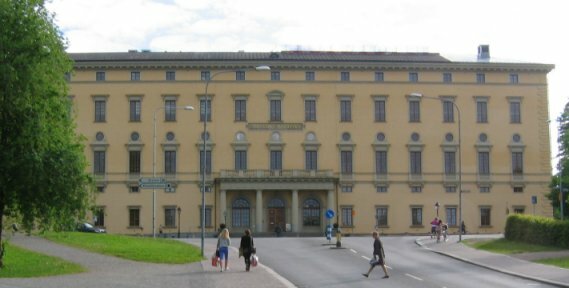 The Carolina Library is the main library of the Uppsala University. It is named after the building where it resides, Carolina Rediviva, the largest university library building in Sweden. The university, the oldest in the Nordic countries, was founded in 1477. Carolina Rediviva was completed in 1841. Carolina Rediviva holds many rare and unique books and documents, the most well-known being the Codex Argentus (The Silver Bible). The Codex Argentus is the most important surviving document written in the ancient Gothic language. One page from this magnificent book is on public display in the building. 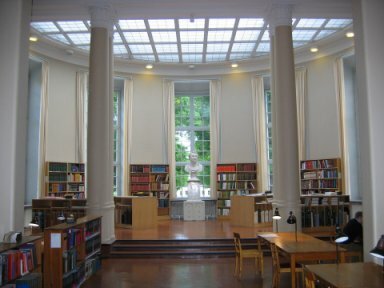 The Carolina Library is one of seven libraries in Sweden to which all publishers are required by law to send copies of all books and other print publications.